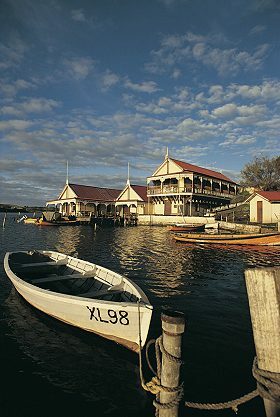 Warrnambool is home to many shipwrecks, a historic boathouse, a recreated maritime village and was Victoria's most active port in the 1880s. A mysterious shipwreck buried deep beneath the sand dunes on Warrnambool's outskirts is just one of the intriguing tales that contribute to the city's unique history. A Portuguese vessel, fondly known by locals as "The Mahogany Ship" reportedly ran aground off Warrnambool in the 1500s. This local legend is supported by the discovery of old Portuguese charts that depict Australia's southern coastline as far as Armstrong's Bay. It is believed these charts were drawn in the 1520s. If ever found or proven the Mahogany Ship and those Portuguese charts could rewrite the history of both Warrnambool and Australia. 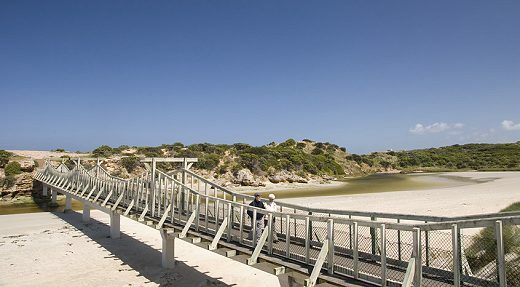 The 22km Mahogany Trail walking track extends from Warrnambool to Port Fairy passing the possible site. Take a walk and see if you can unravel the mystery. A high standard of fitness/experience is required to complete the whole walk. Christina Macpherson was at Warrnambool's Annual Steeplechase Race Meeting in April 1894 when she heard the Warrnambool Town Band play the traditional Scottish tune, Thou Bonnie Wood of Craigie-Lea. Christina memorised the tune and played it to Andrew B. (Banjo) Paterson at Dagworth Station in Queensland in 1895. Banjo Paterson, inspired by a local event, wrote some words to match the tune and our national song, Waltzing Matilda, was born. Christina's original 1895 manuscript of the music is held in National Archives Canberra. Maremma Guardian Dogs have been used in Italy for centuries to protect flocks of sheep from wolves, bears and thieves. Local free range chicken farmer Alan "Swampy" Marsh, who has successfully been using the Maremma breed to protect his chickens from fox predation. suggested that they be used to protect breeding seabirds on Middle Island from foxes and dogs. 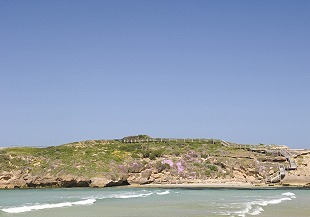 Little Penguins and Short-tailed Shearwaters colonise Middle Island from August to February. Predators have caused their numbers to drop from over 600 birds in 1999 to below 10 in 2005. In 2006 a world-first conservation trial was successfully conducted for four weeks. Two Maremmas, Electra and Ne've now protect the breeding birds on Middle Island. They are cared for by Warrnambool City Council employees on a regular basis. So far there have been no seabird deaths caused by predation and the breeding colony is estimated to be at least 60 Little Penguins. Middle Island is closed to the general public. Getting there: 270 kilometres west of Melbourne by Princes Highway or Great Ocean Road. Daily rail or coach services are available from Melbourne.